The hereness of most paintings, drawings, and collages by Jay DeFeo is as important as their otherness. In fact, they are synonymous. What we see in a work, the enormous drawing called The Eyes (1958), for instance, is another place, not a suggestion or representation of it, but that place itself, where Jay DeFeo was. 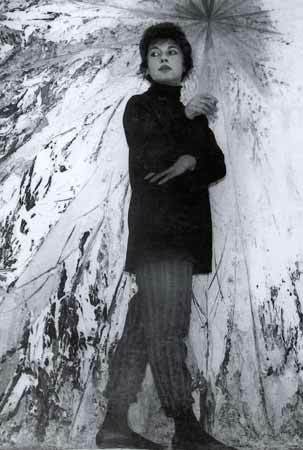 But the place is here, in front of us, and it is, of course, Jay DeFeo confronting herself. In these respects her work is like that of Jackson Pollock, especially the floor paintings he was literally inside of, part of. But her commitment to the place that is both here and there also evokes the immanence of Biblical scenes in Italian church frescos, with which she was familiar from her early studies in Florence. The Eyes, 1958. Graphite on paper, 48" x 96". Whitney Museum of American Art, New York. Gift of the Lannan Foundation. The Eyes are her own eyes, from a photograph, enlarged by a factor of perhaps 15. Each eye in the drawing is about 16 inches across. Though they in some ways appear to be, they are not diagrams of eyes, but the eyes of a particular person, with distinctive outlines and the hairs of eyebrows and eyelashes. They are the eyes of a particular living being, something approaching a wild animal. Despite our recognition of the eyes and perhaps the person, we are somewhere well beyond where we thought we were, and it is possible to see very much more, but also to block out that which may be superfluous (unless we have taken the wrong path, which may or may not be impossible). Now there are only the eyes, including their orbital context; the rest of the face is gone, not to speak of the body, and on and on. Symmetry is a little more complicated than we thought. The right eye (her right eye) is stronger than the left, and the vertical lines framing it on the outside are much stronger than those for the other eye. There are all kinds of indications of perspective into and out of depth: lines radiating downward from the pupils, longer and shorter verticals, grids that angle and curve to the sides and into the middle. Spatial signals are complicated and intersecting in a way that seems to indicate a higher level of physics, a universe of definitive and renewable infinity, something like that of Arakawa's work in the 1960s and later. We are in that world--which is in this world--wherever else we may be. However profoundly DeFeo enters into this transformation, the origin of any given work is always in something that exists as a specific motif in the orbit of her own sentient and sensual being. In two collages of 1958--the one in the show is Applaud the Black Fact--the motifs are naked female bodies from magazine reproductions fused together in propeller-like shapes that seem about to spin into space, in other words to propel themselves, surrogates for the artist, either inward or outward toward other states of being. Her own false teeth are the original object Crescent Bridge I and Crescent Bridge II (1970-72), two large paintings that form a diptych in which the images float like some kind of space ship moons against a dark (night) background on the right and a light (day) background on the left. 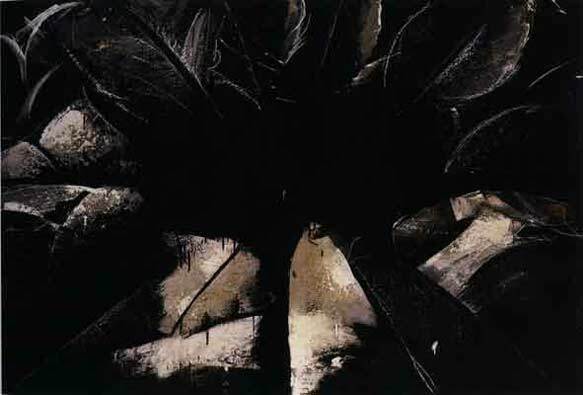 Their powerful astral presence is possible because these images have their origin in something that is already a functional integer of life (DeFeo's life). The object becomes another object (the painting) which in turn reflects back on the original object the aura that has evolved. The Crescent Bridge I, 1970-72. Synthetic Polymer and Mixed Media on plywood, 48 x 66 inches. 128 7/8" x 92 1/4" x 11". Gift of the Estate of Jay DeFeo and purchase, with funds from the Contemporary Painting and Sculpture Committee and the Judith Rothschild Foundation. The Rose, the monumental work that the Whitney Museum helped save and now owns, almost literally illustrates DeFeo's transformative process. For the first seven years of her work on it (1958-65), the painting occupied a bay window area in her apartment, with its back toward the main windows and light streaming in from the side windows. At first it was called Deathrose ("Death Throes", as Lucy Lippard noticed, "Death Rows," or "Death Rays"), with a burst of rays focused off-center like The Eyes. The painting at that point had an asymmetrical focal point into which everything vanished. But gradually, as DeFeo chipped away at it and added to it, the painting took on life, was centered on an even larger canvas, and ultimately became The Rose, nurtured by the light coming through the windows at its back and sides and the artist at its front. In his brilliant essay for the book that accompanies the show (Jay DeFeo and The Rose, Jane Green and Leah Levy, eds., University of California Press, 2003), Richard Cándida Smith writes, "She aimed for a revelation of the emergence of order, establishing its inescapable mystery by placing the source of the emergence in a physically impossible space on the other side of the canvas." The painting, in all its changes and thicknesses, is between two places, the universe outside the window and the one inside Jay DeFeo. Cabbage Rose, 1975. Acrylic on Masonite, 48 3/8" x 72 5/8". 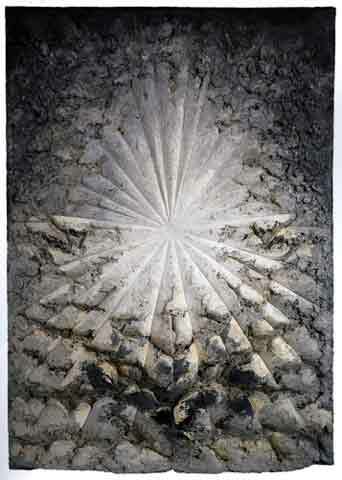 Collection of the Estate of Jay DeFeo. The last dated painting in the exhibition is Cabbage Rose of 1975, which again derives from the photograph of an actual plant form recast as something beyond comprehension, petals gathered around a black void. The light that seemed to emanate from The Rose now clings tenaciously to the coruscated surfaces of the petals, and in the center, against the blackness is a tiny, almost accidental or inadvertent white cross. The source of light is very far away indeed, but it is there. The strange thing is, at a time when the Whitney had two other extraordinary shows on view--drawings of Arshile Gorky and self-portraits of Lucas Samaras--that DeFeo's work was given the small gallery off the lobby rather than the full second floor. It would have been nice to see more of her work from the '50s through the '70s, and especially her extraordinary paintings of the '80s. But then, neither did I know about her or include her work in my book on American painting in 1989, the year she died. The exhibition was at the Whitney Museum of American Art, 945 Madison Ave. New York, NY 10021. Art Review - NYArtWorld.com - NYAW.co. All artwork is copyright of the respective owner or artist. All other material © Copyright 2018 New York Art World ®. All Rights Reserved.